Microwave heating, a form of dielectric heating, is understood as the generation of heat in materials of low electrical conductivity by an applied high-frequency electric field. For a substance to be microwaveable it must possess an asymmetric molecular structure, as in the case of a wate molecule. 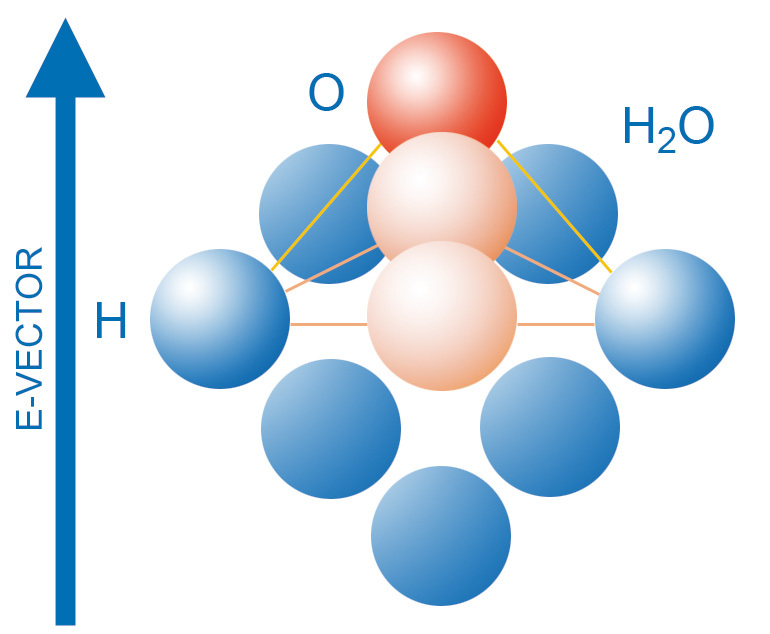 The molecules of such substances form electric dipoles, which try to align with the orientation of the electric field (Figure 1, right side). It is this orientation polarization that is responsible for energy generation. For details on the complementary mechanism of space charge polarization, see "Energy transformation in the molecule". Figure 1. Molecular oscillations of polarizable substances under the influence of an alternating electric field. 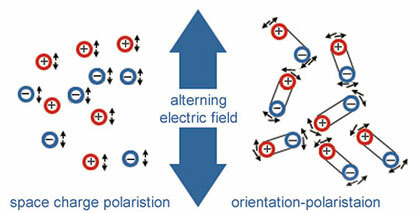 The influence of an alternating field allows the dipole molecules to undergo oscillations in response to the high frequency field's polarity changes. The intermolecular friction produces high-frequency energy which is first absorbed and then transformed into thermal energy. Substances with a symmetrical molecular structure, such as benzene, cannot be heated in a high-frequency field, since they lack the necessary dipole characteristics. Apart from the dipole molecules, freely movable ions can also be influenced by an alternating electric field. The collision of these flowing unbounded ions leads to resistive heating (Figure 1, right side). Due to these collisions and following transformation into thermal energy high-frequency energy is again absorbed. Generally, this proportion of transformed energy - especially at the almost exclusively employed frequency of 2450 MHz - is relatively small compared to the proportion produced by dipole oscillations. However, electrolytes, salt solutions, glass and ceramics are an exception at high temperatures. As for these substances, a considerable amount of heat increases upon reduction of the frequency, which may be attributable to ion movement. By using microwave energy, heat is generated inside the product volume by directly transforming the electromagnetic energy into molecular kinetic energy.